Rescheduled from January! Justice is good to practice any time! Learn how to be an UPSTANDER, rather than a bystander! Great for middle schoolers, high schooler (and home schoolers of that age) and adults. The MLK holiday is considered a National Day of Service that encourages individual and collective acts of volunteering. 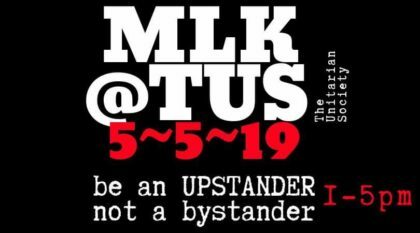 Originally scheduled for that holiday, but postponed due to weather, The Unitarian Society is hosting this event which will honor Dr. King’s legacy by providing the community a daylong event, “How to be an Upstander,” a chance for participants to learn how to interrupt hate. Folks are encouraged to come to any one or all parts of the afternoon. Space is limited to about 90 participants. Tickets are free but you must register at the link included here. We welcome community co-sponsors – financial help to cover costs, volunteers on the day (set up/clean up), and getting the word out.